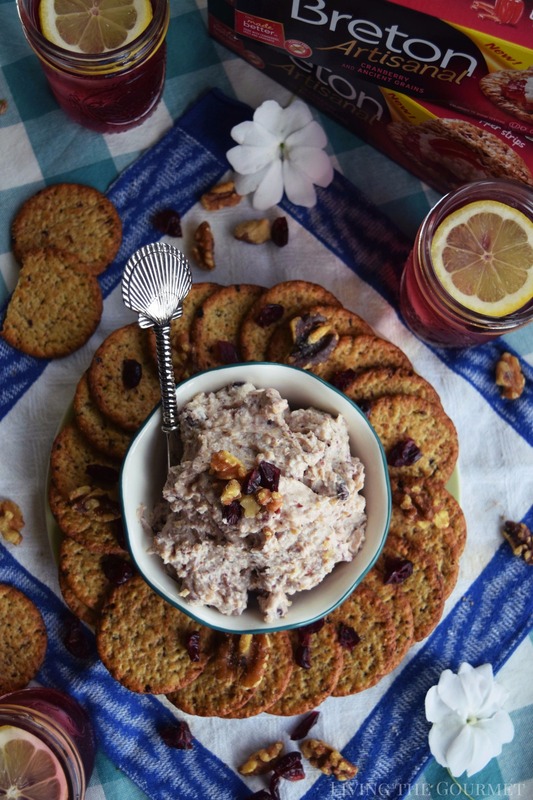 This Cranberry, Walnut and Honey Spread is a perfect way to end off the summer. 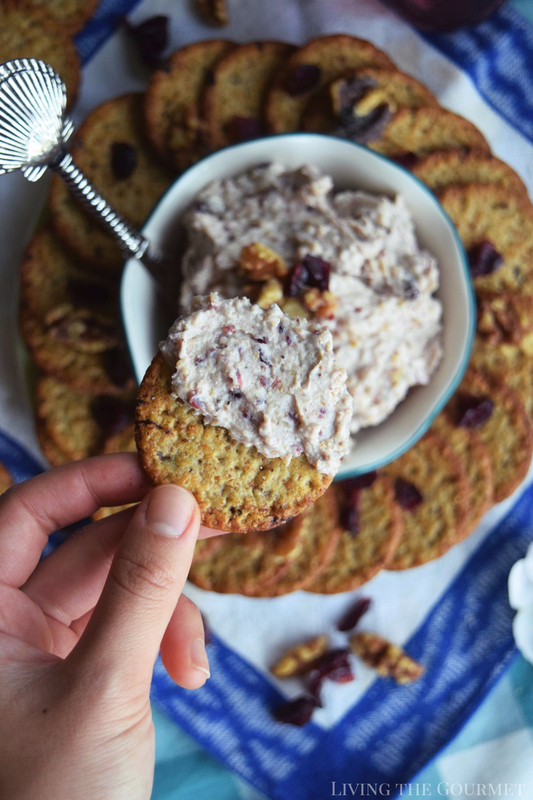 It is a light, delicious spread that combines that some of our favorite Fall flavors. We’ve all heard the trope that we “Make our own happiness,” and while I have a tendency here to poke thinly veiled fun at assorted clichés, before I do let’s play a little thought experiment, one I learned from a gray-eyed professor of mine some years ago. While no two students received precisely the same instruction, the instructions more or less followed a certain theme, make educated guesses as to the contents of each box based on its exterior design and color, pen a brief sophist style essay as to why the contents of the boxes ought to have been different as they were opened, or forfeit the exercise altogether, again penning a creative piece as to why the boxes were, in essence, representative of a set of lies. In each case, the student’s participation was over once their clock ran out, at which point they were to leave the classroom, returning again once the exercise had finished. Optionally, all students had the choice to simply wait out their assigned clock entirely, provided they did so in perfect and undisturbed silence. The catch? Waiting out the clock guaranteed a perfect score. Naturally, befitting a philosophically-inclined ethics course, the ‘waiting parlor’ was representative of life itself, and was meant to convey the importance of effort, creativity, and risk-taking. I found myself thinking about this the other day, when at the end of a long line of content creation, and I remembered I had an old friend stopping by for an early evening visit. I’ll admit that I was quite tempted to simply reschedule – to more or less let the ‘autopilot’ of my schedule carry on. Naturally, being who and what I am, once my subconscious phrased the proposition in more or less those terms, I simply couldn’t give in. That being said, I decided to put together something that was at once seasonal, simple, and of course delicious. 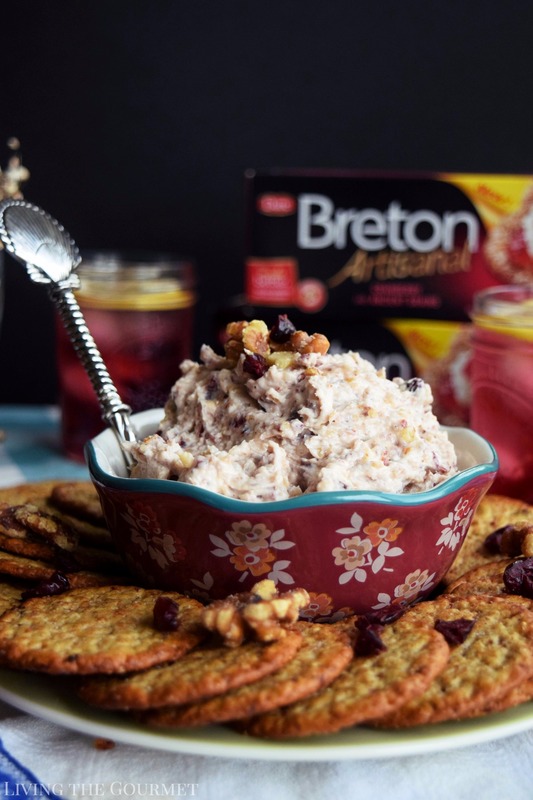 Of course, this brings us to today’s recipe – a Cranberry, Walnut and Honey Spread served with Breton Artisanal Cranberry and Ancient Grains crackers. 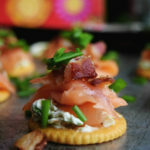 After that, assemble the mixture on the crackers, and for this, I do prefer Breton, due to their reliable quality, which makes them a perfect solution for those busy occasions where you don’t want to skimp on flavor. 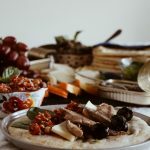 Add to that the wide variety of delicious flavors and texture in which they’re available, and you’ve got a cracker perfect for every occasion and any palette. Heat a small cast iron frying pan and place the walnuts in the pan for a minute or two; let the walnuts cool for a minute or two. 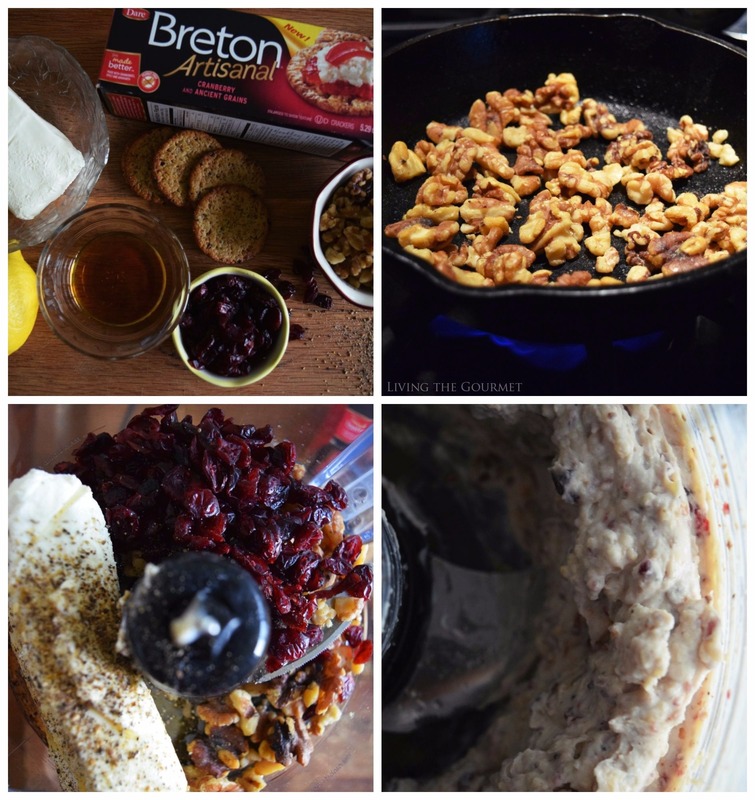 In a food processor combine the cream cheese, walnuts, cranberries, honey, lemon juice, fresh ground black pepper and a pinch of salt. Process until a desired consistency is reached. 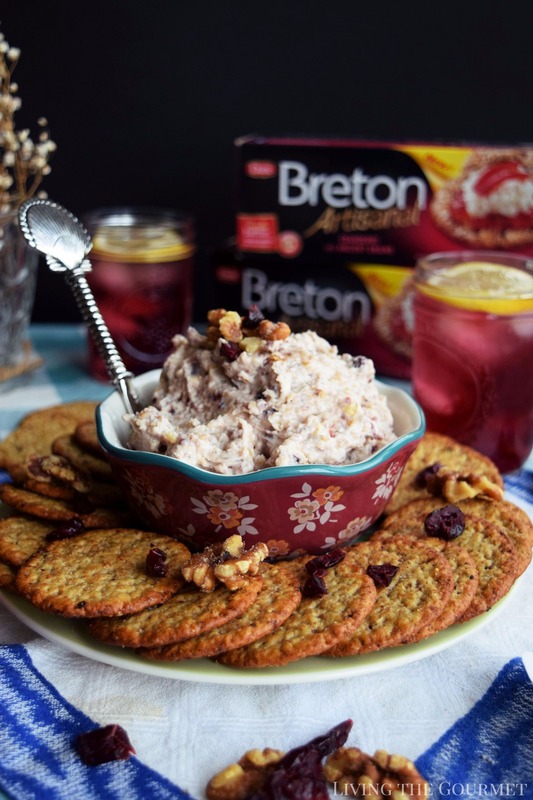 Enjoy on the Brenton Artisanal Cranberry and Ancient Grains crackers. 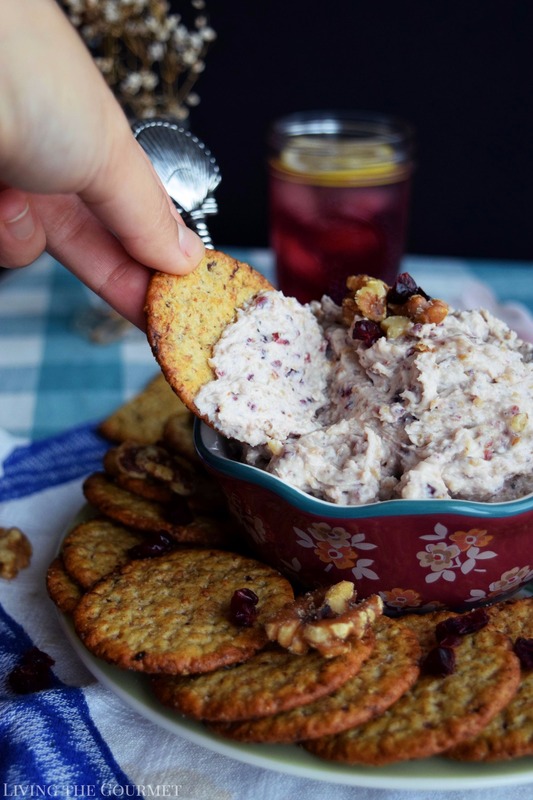 Once you’ve assembled a tray of the crackers and the mixture, garnish the tops of the crackers with additional dried cranberries and walnut pieces. Serve along with your favorite early evening beverage, and you’re good to go. Now, who says making one’s own happiness need be complicated? I know what I will be serving around Thanksgiving this looks amazing! This looks delicious and it such a good post... I always want to cancel plans to carry on with my schedule, but then I'm SO much happier when I get out and see friends, family, etc. This just got added to my list of things to make this Thanksgiving. It looks simple and delicious. 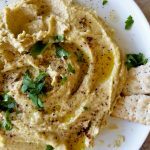 What a beautiful and flavorful dip! I must say it would good perfect on those crackers. Pinning for holiday menus.